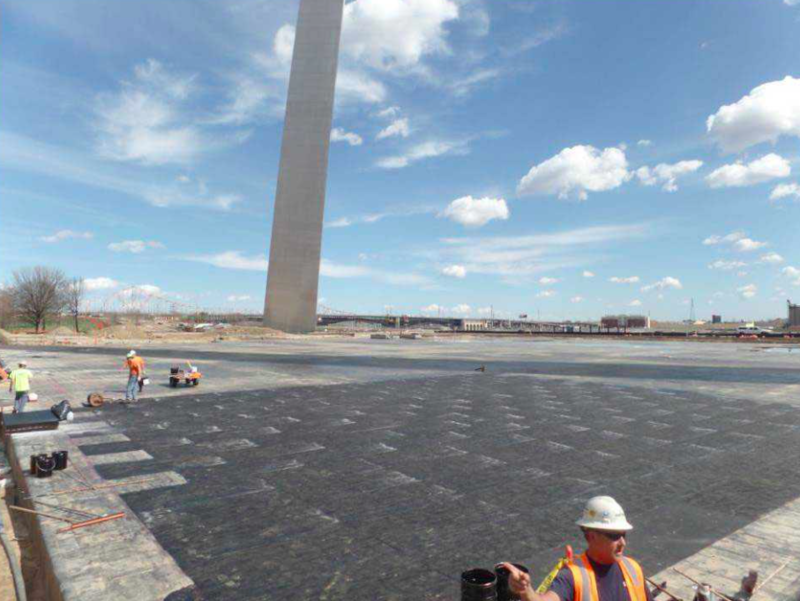 Western Specialty Contractors restored the roof of the Museum of Westward Expansion located beneath the Gateway Arch in St. Louis. This shows the protection board installed prior to adding the leak detection system. 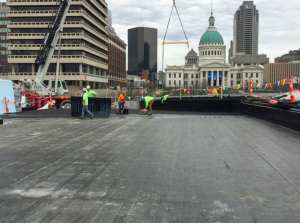 The St. Louis branch of Western Specialty Contractors recently completed a project to restore and waterproof the roof of the Museum of Westward Expansion located beneath the iconic Gateway Arch on the St. Louis Riverfront. The work is part of a multi-phase project, spearheaded by nonprofit organization CityArchRiver Foundation, to expand and renovate the underground museum, plus renovate the grounds surrounding the Arch. The Jefferson National Expansion Memorial, which includes the Gateway Arch, Museum of Westward Expansion and the surrounding park, is maintained by the National Park Service. Opened to the public in 1976, the Museum of Westward Expansion has undergone very few changes since its grand opening. The size of a football field, the museum features rare Native American Indian artifacts and materials documenting the days of Lewis and Clark and the 19th century pioneers who shaped the history of the American West. Work on the 100,000-square-foot museum roof project began with removing sod and sandy soil covering the top of the roof and 10-28 inches of Elastizell engineered fill using a bulldozer. Next, the existing waterproof membrane was removed from the structural concrete deck. After two layers of modified bitumen sheet waterproofing were installed, crews apply a coat of adhesive to adhere the asphaltic protection board. 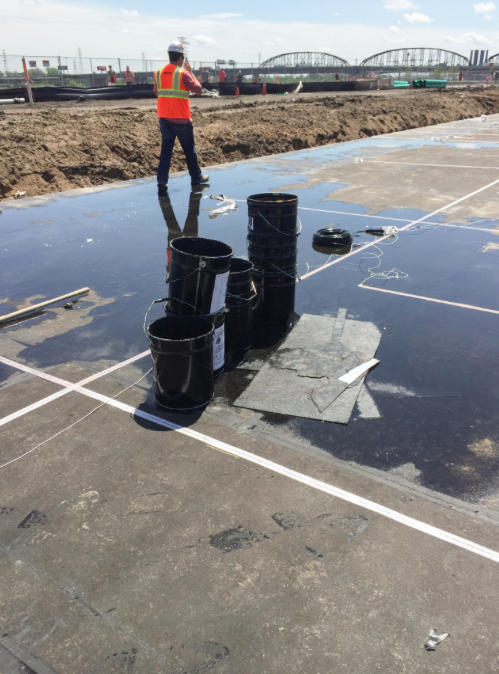 Once the deck was exposed, Western crews went to work identifying and repairing leaks in the existing museum lid that had been present for many years, as the existing waterproofing had exceeded its lifespan. Several methods were used to evaluate the condition of the structural concrete deck, which included a chain-drag sounding along with visually identifying delamination and cracks. 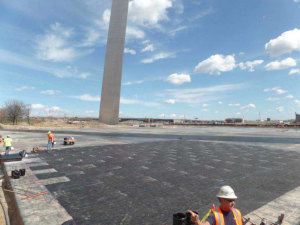 Western crews then installed a two-ply Laurenco modified bitumen sheet waterproofing system covered with WR Meadows PC2 protection board. An electronic leak detection system followed by a permanent leak detection grid system were installed over the protection board. Crews then installed a layer of 1-1/2 inch, 60-psi Dow extruded polystyrene with an additional layer of the protection board and a J-Drain 780 drainage mat. The next phase of the project involved waterproofing the 42,000-square-foot horizontal lid and the 37,000-square-foot vertical walls of the museum addition. Western’s scope of work in this area included installing a two-ply modified bitumen sheet waterproofing and protection board, as well as an electronic leak detection system, along with two layers of extruded polystyrene. A layer of extruded polystyrene was also installed on the vertical walls, followed by the drainage mat on both the horizontal and vertical walls. During portions of the project Western crews were working over occupied space, as the museum was largely operational during construction. Additional waterproofing of the north and south museum entrances encompassed approximately 13,800 square feet, which included approximately 5,000 square feet of deck around each leg of the Arch. The museum was largely operational during construction, and for much of the project Western crews were working over occupied space. The company sequenced the removal of existing roofing material so that they could remove, clean and install new roofing material daily to keep the museum dry during construction. Testing was a daily requirement during the waterproofing installation. Western was required to complete a pull test for every 500 square feet and take moisture readings for every 100 square feet. Daily observation reports had to be completed during the waterproofing application, with all testing results and location tests documented along with the weather conditions. Additionally, Western crews took 50 photos daily to document the testing and work area. Construction on the Arch grounds began in August 2013, while renovations to the museum and visitor center began in April 2015. The multi-phase project is still underway, and the improved underground Museum of Westward Expansion is expected to be finished by summer 2018.